Yes, it’s been quite a while since I wrote anything and for that I apologize. But instead of dwelling on the negative, let’s talk Christmas. In fact, let’s talk about a game as well. And let’s talk about a story. 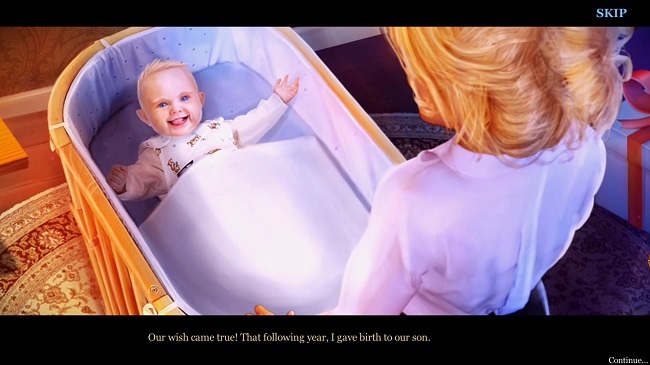 Let’s talk about the game Christmas Stories: The Gift of the Magi. It is Christmas after all. Last year I played Christmas Stories: Puss in boots and I made a Let’s Play of it over on my Youtube channel. Mostly for fun, feel free to check it out but it’s not necessary for this review considering they’re barely connected. At this point it’s kind of become a tradition of mine to play these games as they’re released annually and they do a really good job of getting me in the holiday cheer. This year I decided to play it a bit earlier than I’d like but there’s a reason for that which I’ll be getting to in a week or so. On to the game then! It’s Christmas Eve, a time for celebration and gathering the family. But your only family, your sister, is suddenly kidnapped by Bertha, an evil woman who kidnaps bad children and turns them into Christmas tree ornaments and you’re facing the same fate. 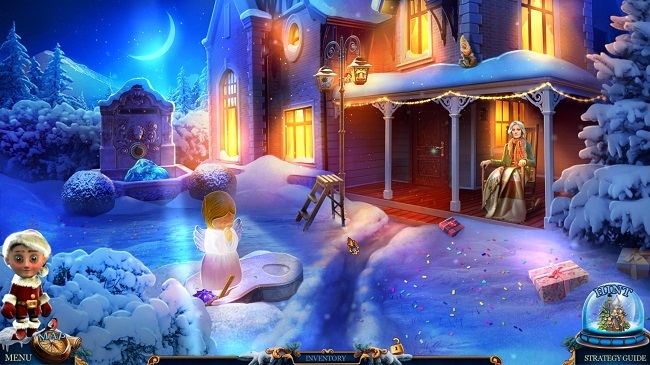 But then suddenly Jack Frost intervenes and says you can still save your sister with a bit of Christmas magic. All you have to do is perform three Christmas miracles and you’ll have enough magic to defeat Bertha once and for all. With the help of Jack Frost, a Santa Elf, some mice and cats, you’re off on an adventure that will change your life. With Puss in Boots I felt that the Christmas theme was a bit weak. I love cats and I love Christmas but the connection doesn’t seem all that obvious to me. Sure, the story did include Santa and some miracles but it was definitely the weakest in the series and while I enjoyed it, it was more for the cats than anything. ‘Cause they were friggin’ adorable. So I was rather hoping that the next game in the series would include the cats again. And… it did. Sort of. The story itself is nothing special, it’s refreshingly unapologetic about being a Christmas game and I really enjoy that. While it is important to not overindulge on Christmas stuff like this, one or two games like this per year plus a movie or two is just perfect in my opinion. Going around performing Christmas miracles in a Christmas card landscape just really hit all the correct notes and as I played it I just entered this lull of comfort and there was nothing else but the game. Normally I’d complain about the use of blue in games like this but here it really works because the stark contrast between the cold blues and the warm yellows. And it really works for Christmas games and I’d be a bit of a fool to expect anything else. That said, there were parts where I thought they overused the color blue a bit too much, especially indoors where you’d expect the yellows and reds to dominate much more. And it would’ve been a lovely touch to go from the cold outsides to the warm insides, like it is in winter, but as it was it felt like the insides were almost as cold as the outside… if that makes sense. few studios to use 3D art quite a lot, especially when it comes to moving objects, and I appreciate this. Their insistence on using it also means that they’ve gotten much better at it so while it’s obviously not up to AAA game standards, for a HOPA and in this style of game it really worked. The animations were smooth and it felt life like enough to never get on my nerves. They also did a great job avoiding stilted animation in cutscenes by using either 3D models or 2D scenes but animated very lightly, giving it more of a story book feel than anything else. 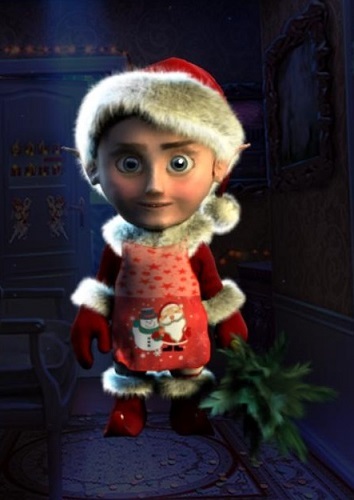 Even your primary helper, the little elf, was 3D modeled and that’s not nothing. 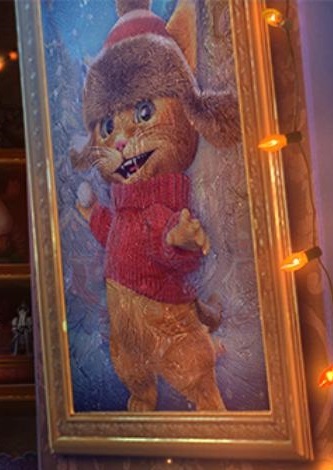 He even had little animation cycles where he ate candy canes and the like when he wasn’t being used. And though that’s great, the little guy really needs to cut down on the sweets, he eats way too many. But all the other little helpers you get throughout the game are also 3D animated so that’s definitely a thumbs up. Sadly they’re not used that much and though the elf has some cute usage, the others are significantly less useful. I really thought having to combine the helper with other items to make them viable was clever but the other helpers were more like the one-time use helpers you get in many other games. So a more expanded repertoire for the other helpers would’ve gone a long way. 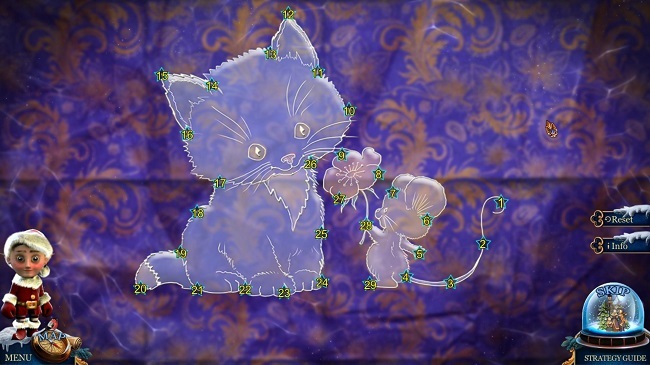 What I particularly liked about the graphics, or rather the design, is that the game constantly pays tribute to the previous gamse in the series, especially Puss in Boots as the cats appear in various small roles, or rather, props in the scenery. Either as a picture on the wall or part of a hidden object scene. The bonus chapter went full on kitty-mode which was kind of fun but the fact that there were just playful reminders of previous games was just spot on as far as I’m concerned. Relegating their active role to the extra chapter was right. Speaking of hidden object scene, this was maybe the first time that I thought a HOPA went a bit too light on this aspect. 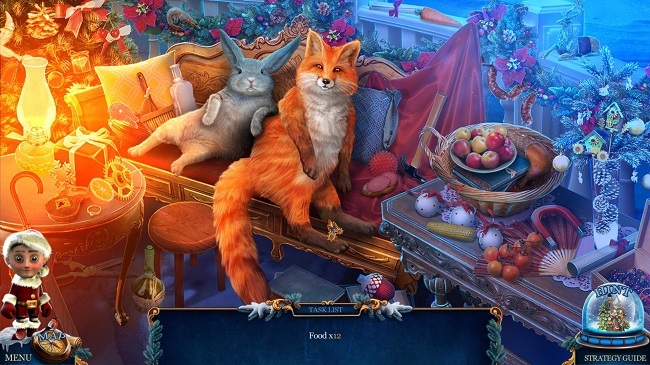 Normally I feel quite worn out from hidden object scenes by the end of a game but not this time. But maybe it worked in the game’s favor since I actually enjoyed the hidden object scenes until the very end of the game. There was quite a bit of variation in the scenes, ranging from simple lists to silhouettes to scenes that mixed things up. Like this one where you had to find food to feed two slightly chubby animals. I sure hadn’t seen that before. So there was definitely a big chunk of creativity in the scenes but there were moments where the time between hidden object scenes was quite large and that’s a bit of a shame when they did so well in this department. But perhaps it was a blessing in disguise, would I look so favorably upon the scenes if there were more of them? Or did they strike just the right balance where I wanted more? Hard to say. 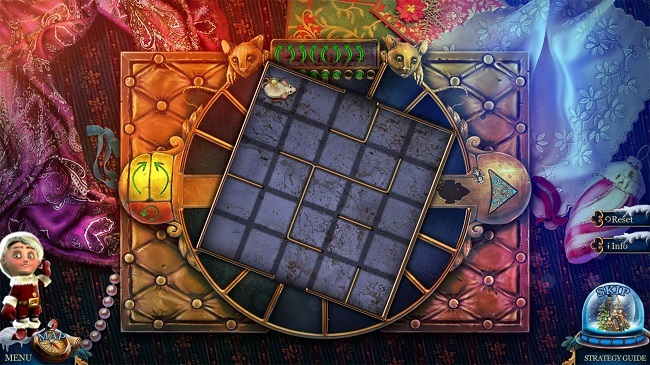 My only complaint about the hidden object scenes relate back to what I was saying about color. The blue and yellow color scheme is very evident here as well and most of the time it doesn’t really bring anything to the scene. 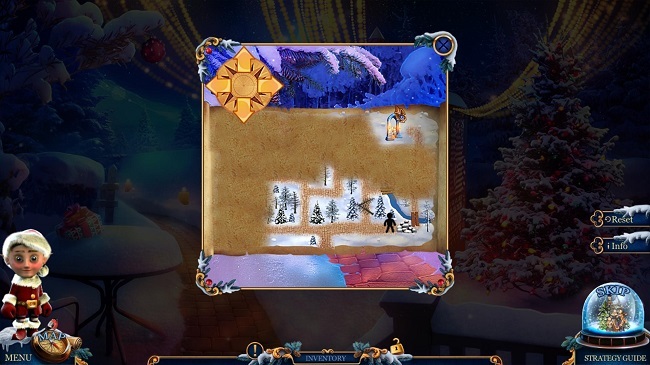 When you’re out and about, walking around in the snow-covered town or similar, it makes sense but zoomed into hidden object scenes and that whole warm/cold aesthetic doesn’t really apply. So it felt like it was there more for sake’s sake and because it made sense. But it’s a nitpick which I absolutely have to make clear. The scenes work, some more than others, but they all work. I never felt they were in the way or just a momentary obstruction, they were all good fun to play. And the same applies to the puzzles. There were some hard puzzles in there. The one featured below had me struggling a lot and it actually took me a long while to get done. Not that all of them were difficult and many of the minigames were just a tad too much on the easy side. 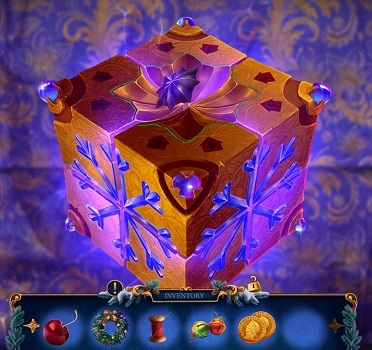 But even the easy ones were typically fun to play and the standard puzzles that show up in a lot of HOPA were typically short and sweet, never lingering for too long. Or given too much importance which is how I really like it. Instead some new and inventive puzzles were given top billing and that’s a good thing. And a few puzzles I haven’t seen in forever made a quiet return which was super nice. And here more than ever the line between puzzle and minigames become blurry. Because is “connect the dots” really a puzzle? Is a maze a minigame? Not that the distinction is that important in the grand scheme of things but it’s something I enjoy thinking about and this time I struggled with the definition. I categorize all my screenshots before uploading according to franchise, game and what it depicts so I always have to consider what I think each subject is. So, for instance, I consider the mouse labyrinth above a puzzle because the added twists demand more thought whereas the labyrinth to the left I think of as a minigame because not much thought is required, you just try and try again until you run out of options. One thing I really liked about the design though is that each miracle wasn’t self-contained. Sure, you completed one and you moved on to the next, never to return again, but many of the items you pick up aren’t used in the current miracle but rather in a later one. It may seem like a weird thing to really appreciate but carrying something with you for a large portion of the game, thinking “Where does this thing go?” and then finally finding the place for it? It’s an epic feeling. And there’s two items that you carry with you at all times: a snow globe that keeps track of your progress and a puzzle box that keeps giving you items if you feed it stars. Now, the globe isn’t particularly interesting but the box actually ended up being one of the better parts of the game simply because of it staying with you. And it was a constant source of puzzles and minigames as each time you fed it a star, you had to complete a test to get the item. Normally I wouldn’t comment on something like this unless it was very special but it was in the closing moments of the game that it was elevated to something more, something different. Because this isn’t the first game to do something like this nor will it be the last. But it was the first game I played where the persistent item was sentient… yes, this box is alive. That’s the message you get when solving the box’s last puzzle. At first I thought it was a message from Jack Frost but no, ’cause he totally shows up again. So this is the puzzle box’s last message for you. Which means it was always aware and it chose to stay with you by its own will. That’s… more complex than I think Elephant Games ever intended for this game to be. Because that message actually made me hurt inside because all of a sudden I saw the box as a reliant supporter and not just an item. And I had, kind of, lost a friend. And the rest of the game is pretty dark too. Normally games like these have some darkness to them but things tend to get wrapped up pretty nicely by the end. And this game does wrap things up in a warming manner but it doesn’t scrub away the underlying darkness. Each miracle starts off in a pretty depressing state but gets wrapped up rather nicely but it’s the final miracle, where you have to collect a couple of letters for an old woman, that really punches you in the gut as it revolves around the death of her only son when he was just a child. Now, I’m not going to spoil more about that than I already have because the proof is in the playing. It’s not really that hard to guess how this miracle ties into the plot of the game or how it’s going to turn out but it’s still an emotional turn. And the game is filled with these little stories that starts out breaking your heart but then mends it again. 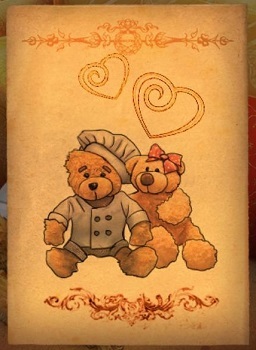 Just a small act like reuniting two teddybears really made me a bit giggly since it was such a simple little act yet drove home the message very hard. Plus, I have a serious thing for proper cuteness. Not cutesy stuff or pretty things but cute. Heart warming and cute. And this game delivered that in friggin’ spades. All accompanied by a gorgeous soundtrack with a particularly awesome rendition of O Holy Night leading the charge on the soundtrack. No, really, this version gave me goosebumps and if nothing else, this game gave me a permanent fixture on my Christmas playlist. But even the other songs on the soundtrack fit well with the Christmas theme. My only complaint about the music is that it reuses a track that I heard to death in Found a few years back when it had a Christmas patch but… really, if that’s not petty and personal, I don’t know what is. So, is this game good? Well, yes, if you read this far, you know I think so. It was actually way above what I expected for an Elephant game since I think they’ve gotten quite lazy as of late. Surface and Mystery Trackers have lost their shine in my eyes and most other series seem to have stretch marks at this point. BUT I will say in fairness that I am not up to speed on their series except for Christmas Stories and there are many I have yet to try. I am seriously tempted to play Chimeras but I just haven’t gotten around to it. So it could be that I’m just missing out. But The Gift of the Magi is a seasonal game so it’s now or never, really. If you don’t play it now, chances are you won’t get what I got out of it. Sure, it’s a good game any day of the year but it’s a game that relies entirely on you wanting to get into the Christmas spirit. So if you’re looking for a great Christmas game, this is right up your alley.